Something different that appeals particularly to the mechanically minded is Lille's museum devoted to windmills. Situated on the highway to Roubaix, the Musée des Moulins boasts two preserved pivoting windmills, which visitors can watch in operation grinding corn, as well as a museum detailing the history of windmill technology. Visitors can tour the full facility, or just one or two of the sites for reduced admission if pressed for time. It is quite a fascinating place. One of the museum's aims is to preserve not only the windmills but also the industrial French heritage that they represent: the hard work, toil, endeavour and achievements of the people who made and operated them. They want to ensure that future generations can see and understand windmills, once such vital technology, and once such a common sight all over France. 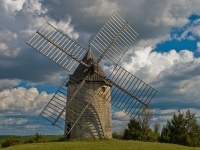 So far, they have restored about 45 windmills (and watermills) and are continuing with their labour of love.